Be the first to share your favorite memory, photo or story of Reverend John . This memorial page is dedicated for family, friends and future generations to celebrate the life of their loved one. Reverend John Leonard Brundage, 74, was born June 28, 1944 to Jean Leonard and Robert Brundage and died on March 16, 2019. He is the second oldest of four children: Michael, Mary Ellen, and Robert. 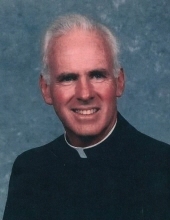 Father Brundage attended St. Joseph School, Roselle, for two years, followed by St. Rose Grammar School, Belmar; and two years, of high school in St. Rose High School, Belmar before transferring to St. Thomas Minor Seminary, Bloomfield, Conn., where he completed high school and his first two years of college earning an associate in arts degree. He attended St. Mary Major Seminary, Baltimore, MD, where he earned a Bachelor of Arts degree in philosophy and a master’s in divinity degree. Father Brundage was ordained a deacon in St. Mary Church, Roland Park, May 30, 1969, and was ordained to the priesthood in St. Rose Church, Belmar, May 23, 1970, By Bishop George W. Ahr of Trenton. Father Brundage served as a parochial vicar in St. Mary Parish, Perth Amboy, and St. Mary Parish, Deal. He served on the Marriage Encounter Movement until January 1981, when he became parochial vicar of St. Joseph Parish, Bound Brook. In September 1981, he was named pastor of St. Bernard of Clairvaux Parish Bridgewater, where he served for 17 years. Father Brundage then worked with Catholic Charities as a prison chaplain before becoming parochial vicar in Most Holy Redeemer Parish, Old Bridge. He served as parochial vicar of St. Matthias, Somerset until March 2005, when he was installed as a pastor of Corpus Christi Parish. Father Brundage retired in June 2013. Father John had a passion for sailing. He sailed his boat from the Jersey Shore to Block Island and the coast of Maine. After retiring he sailed to Key West and St George, in the Bahamas. He settled in Marathon as his home in the Florida Keys residing on his sail boat “The Europhic “. Viewing will be held Wednesday, March 27, 2019 from 4:00-7:15pm at St. Bernard R.C. Church in Bridgewater, followed by a mass of commemoration presided by Most Reverend Paul G. Bootkoski. A viewing will be held from 10-10:30am on Thursday, March 28, 2019 at St. Bernard R.C. Church presided by Most Reverend James F. Checchio. A funeral liturgy will follow at 10:30am in church. Burial will be held at St. Bernard Cemetery in Bridgewater, NJ. Funeral arrangements are under the direction of the Branchburg Funeral Home 910 US Highway 202 South, Branchburg, NJ 08876 (908.526.7638). Visit www.branchburgfuneralhome.com to send condolences. Memorial contributions may be made in his memory to the American Heart Association 1 Union Street Suite 301, Robbinsville, NJ, 08691. To send flowers or a remembrance gift to the family of Reverend John Leonard Brundage, please visit our Tribute Store. "Email Address" would like to share the life celebration of Reverend John Leonard Brundage. Click on the "link" to go to share a favorite memory or leave a condolence message for the family.